This delightful deciduous tree/shrub is a welcome addition to landscaping possibilities. Its height is variable - from ten to thirty feet - but it usually ranges around twelve to eighteen feet. 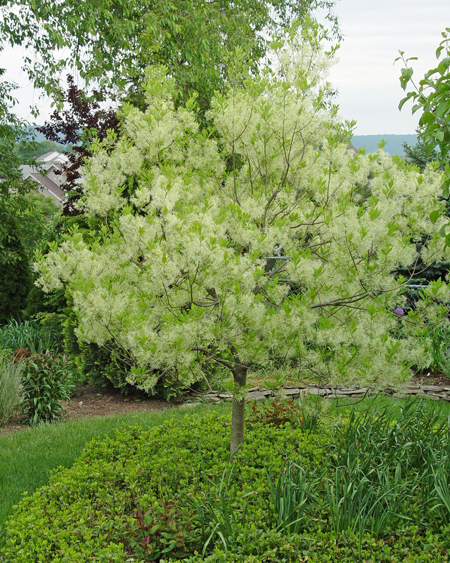 The Fringe Tree is often multi-stemmed, lends itself to naturalizing, and blooms just when fresh blossoms are needed after most other spring flowers have faded. Pollinated female flowers mature to blue-black fruits. Eight-inch, glossy dark-green leaves add to its beauty. 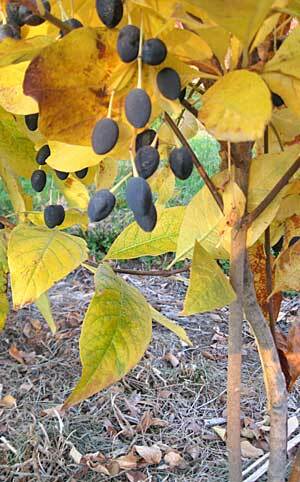 It is cold hardy, loves summer heat but tolerates some shade, and turns a pleasing yellow-to-old-gold in the fall. This shrub/small tree, with its spreading habit and peeling or deeply furrowed bark, is noted for its fragrant white flowers borne in loose, 4-8in clusters, August through September. The blooms, coming on when little else is in flower, and its general appearance speak well to its inclusion in a shrub border or its use as a specimen. Add the fact that it does best in long, hot summers, and it is a winner in our area. Give it full sun, well-drained soil, and moderate water.